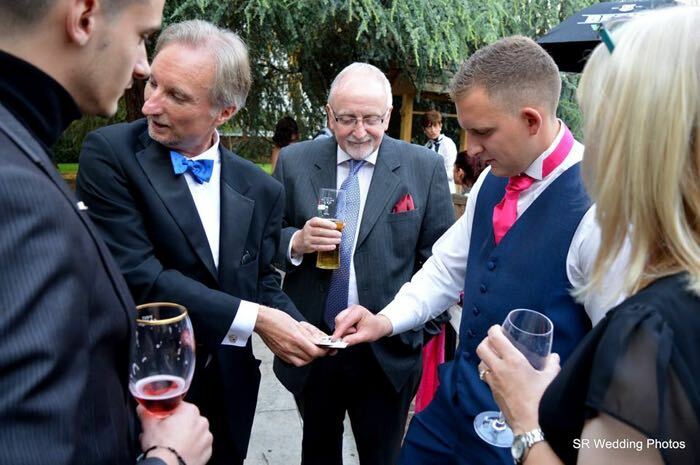 Why have a wedding magician at your wedding reception? When the ceremony is over and the wedding reception starts there can be guests who don't know many people and feel on the edge of things. As your wedding magician I can engage with people, draw them into little groups, engage them with my magic and 'oil the cogs'. Children may become restless so its great if there are things for them to do. I can help keep them occupied and engaged. People want to have fun at a wedding. Fun is exactly what I provide. Never mind about me proving anything to people about how good a magician I am. As long as people enjoy themselves that makes a great event for me. 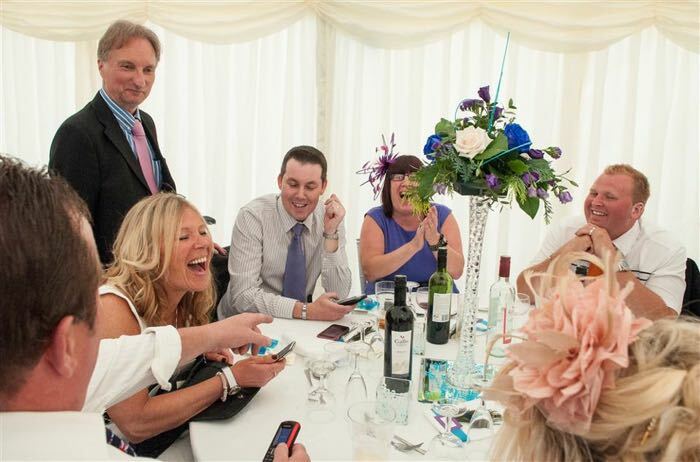 Magic can be a wonderful ice breaker at the reception and can work to bring people together when there are two sets of families and friends who may not necessarily know each other. As your wedding magician I will arrive at least half an hour before your reception starts. I will then be ready to perform as soon as your guests start to sip their first drinks. The style of magic I do at the drinks reception is called strolling magic. I perform effects that I can carry in my pockets and that don't need a table. The magic is close-up and sometimes happens in the spectator's own hands which is an interesting experience for them. 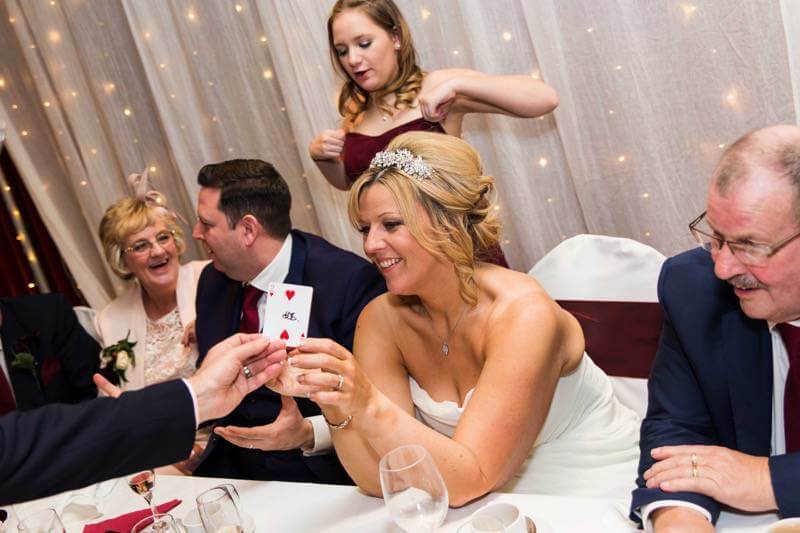 By the time you sit down for the wedding breakfast a lot of your guests will have met me already, know that I am there to show them some close up magic and so will be primed for more fun. I approach the tables in between courses and try and engage the whole table if I can with different effects that can be performed at a table. I keep some special effects exclusively for the bride and groom's table. My style as your table magician is calm, relaxed, respectful and easy going. I'm out to give people a great time, not to prove how good I am. I like to banter with people but its always done in a way that doesn't offend or embarrass anybody. At an appropriate time I will come to your table with some very special effects that I have reserved exclusively for the bridal party. Keep your rings handy. They will come in very useful! Be prepared for some jaw dropping effects and often special, impossible souvenirs to take home. 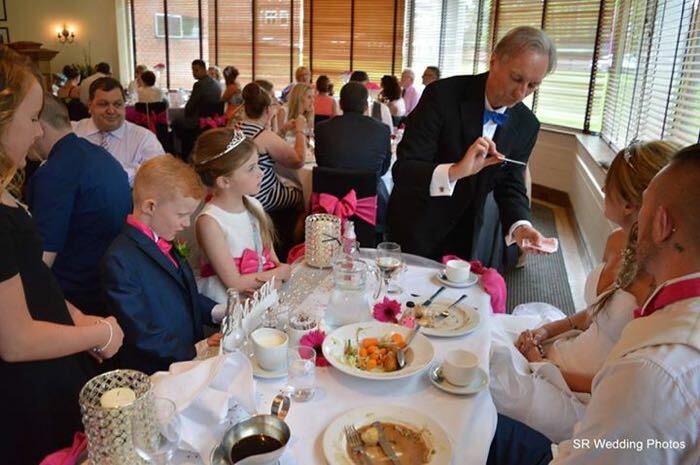 Most venues where I have performed close up magic need some time to clear away the tables where you’ve had your wedding breakfast in order to prepare the dance floor whilst the band or disco get setup. I can be performing magic in a bar area for your guests whilst the room is being prepared. If you have more guests arriving for the evening then this is a great time for me to perform magic for the new arrivals. I have been performing as a close up magician at weddings since 2004. Many of these weddings have been in York but I have also travelled extensively within Yorkshire and the North East and as far as Somerset and Northumberland as a magician for weddings. I love weddings and I am always happy to talk about what I can do to make your day extra special.